If you get tired of seeing the same games at every casino you go to maybe it's time to check out Black Diamond Casino It offers dozens of unique games from TopGame -- and they've just added two new ones. Tales of Egypt brings the mysteries of the Pharaohs to the casino and Swipe Roulette is a visually exciting version of a classic casino game. 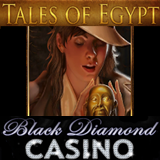 The new Tales of Egypt is a 20 payline video slot where players can bet from $.01 to $5.00 per spin. The Great Pyramid is both Scatter and Wild. Three or more trigger ten free spins in the Raiding the Pyramid feature. After any winning spin players can take the Gamble option which doubles the current payout if the colour of the next card dealt is guessed correctly. The casino has also introduced Swipe Roulette, a new version of one of the world’s most popular casino table games. It’s a European Roulette game (only one zero) that changes its point of view depending on whether the player is betting or spinning. Black Diamond Casino brings the excitement of Vegas-style games to homes around the world with dozens of online casino games from Topgame including new slots like Religion of Champions Brasil, Dwarven Gold, Glorious Rome and Great Reef and all popular table games such as Blackjack. Its progressive jackpot pool is currently nearly $6,000,000. New players are welcomed with up to $999 in casino bonuses.